Figure 1. Anthracnose stalk rot symptoms in a cut corn stalk. As corn silage harvest has begun and the corn grain crop is finishing, there have been some disease issues of note in Wisconsin. Northern corn leaf blight (NCLB) activity has picked up quickly over the last several weeks. This is due to the fact that the weather has become much cooler and has remained wet. These conditions are favorable for the fungus. You will remember that NCLB was observed very early this season. See my previous post on this topic by clicking here.The hotter and dryer weather we saw mid-season was not only good for corn growth, but it kept the NCLB pressure minimal during the critical time of silking and pollination. As stated in the fourth edition of the “Compendium of Corn Diseases” (Carson, 2016) direct yield losses from NCLB are typically minimal if infection is moderate or delayed until 6 weeks after silking. Therefore, the expected direct yield loss from NCLB in Wisconsin in 2016 is expected to be low, due to its late onset. Figure 2. Corn field with considerable lodging due to anthracnose stalk rot. Certainly, there are other issues to consider with this late onset of NCLB. Dry-down will be accelerated. 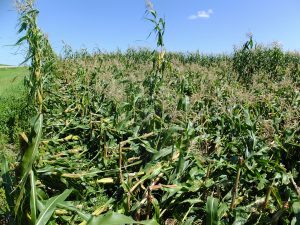 If you have a considerable epidemic in silage corn, then it would be advisable to try to chop as quickly as possible or consider taking the crop as high-moisture corn. Another issue to consider is the fact that a late-season NCLB epidemic can increase the risk for stalk rot issues. We have observed earlier than typical onset of anthracnose stalk rot this season (Fig. 1). Anthracnose stalk rot has been observed in many fields, with a range in severity dependent on the hybrid resistance and field history. Fields in a corn-on-corn rotation, and/or no-tilled, and planted to a susceptible hybrid are at high risk of severe symptoms. We have observed several fields with significant lodging and wind damage where anthracnose stalk rot has advanced quickly (Fig. 2). In other fields lodging has been minimal, but some anthracnose stalk rot can be found. Management of anthracnose stalk rot is multi-faceted. First, choose hybrids with best resistance available. 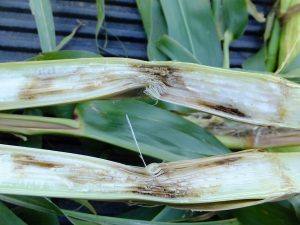 Hybrids that also have good resistance to foliar diseases will also offer an advantage when managing stalk rot, as foliar disease can stress corn plants and lead to increased risk of anthracnose stalk rot. Cultural practices such as crop rotation and tillage to manage surface residue can also help. Other practices that reduce plant stress such as balanced fertilization, proper planting population, providing suitable drainage, and using well adapted hybrids for your location will reduce the risk of anthracnose stalk rot. Finally, in fields were stalk rot is an issue, harvest as early as possible to avoid yield losses from lodging. Fungicides are not recommended for managing anthracnose stalk rot. Attempts to use fungicides to manage anthracnose stalk rot often result in high variability and little translation to a yield advantage. In 2015 we conducted a corn fungicide trial where anthracnose stalk rot was detected at harvest. While higher levels of stalk rot were observed, and some treatments did lead to a significant reduction in stalk rot severity, no differences in lodging or yield were identified among the treatments. To view results of this 2015 trial, click here and scroll down to pages 2 and 3. Bacterial leaf streak – A new disease of corn in the U.S.
Bacterial leaf streak (BLS) of corn has recently been reported for the first time on corn in the U.S. The first reports were in Nebraska with subsequent reports coming in from other states in the U.S. corn belt including Iowa, Illinois, Colorado, and Kansas. Efforts are underway in Wisconsin to monitor for the disease. As of this writing, BLS has not been found in Wisconsin. However, survey and scouting efforts are continuing, to monitor for this disease. Bacterial leaf streak is caused by a bacterium named Xanthomonas vasicola pv. vasculorum. Very little is understood about this disease on corn, as it is so new. This pathogen presents no risk to humans or animals and there is little evidence to suggest that it will have an adverse effect on corn yield and quality. You can click here to read the USDA APHIS Statement on Xanthomonas vasicola pv. vasculorum. To learn more about the disease and to watch a video by Dr. Tamra Jackson-Ziems at the University of Nebraska CLICK HERE. Helpful information and hints on initially diagnosing BLS can be found HERE. Esker, P. 2016. Anthracnose stalk rot: in “Farmers Guide to Corn Diseases” Edited by: K. Wise, D. Mueller, A. Sisson, D. Smith, C. Bradley, and A. Robertson. APS PRESS. M.L. Carson. 2016. Northern Corn Leaf Blight: in “Compendium of Corn Diseases, Fourth Edition.” Edited by: G.P. Munkvold and D.G. White. APS PRESS.